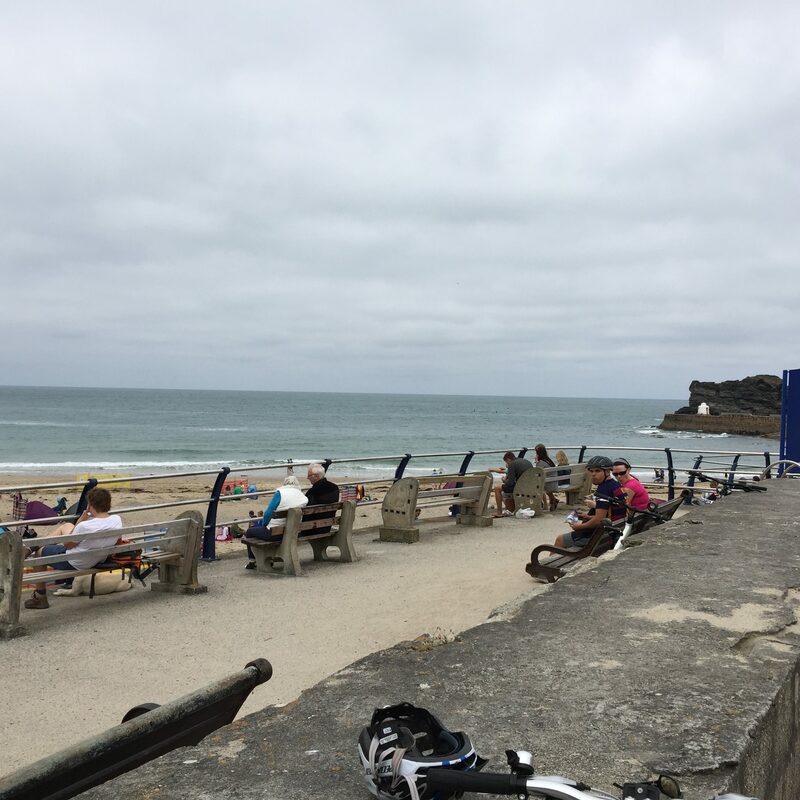 From Devoran to Portreath: the Bissoe cycle trail and Mineral Tramway. When the granite massif of nearby Carnmenellis was produced 300m years ago, the cooling rock left vapours and deposits that became rich veins of metals, principally tin (cassiterite) and copper (chalcopyrite), with some gold, arsenic (technically a ‘metalloid’, a by-product of tin and copper smelting in the later mining period) and other minerals. The Carnon Valley cuts at right angles across these veins, which explains how it became the base of some of the oldest mining activity in the western world. 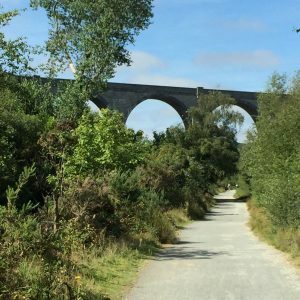 The trail follows the route of the old Redruth and Chasewater (now spelt Chacewater) narrow-gauge mineral railway (or Tramway), which opened in 1825, and included several branches. Other lines later completed the route all the way to Portreath. When mining declined in the latter part of the 19C, so did the railway; it closed in 1915. Devoran ceased functioning as a commercial port at that point, and the tidal estuary had already silted up badly. mostly tin and copper excavated in the nearby Gwennap area inland, were exported on the ships for smelting in S. Wales. Imports were largely coal to fuel the mines’ steam pumps and other materials to keep the mines operative. Its wooden wharf has largely disappeared, but there survive the remains of ore-storage bins, granite mooring-bollards and various former port buildings. For a diagram map of the Gwennap mine sites, from ‘Fortune’ to ‘Busy’, ‘Maid’ to ‘Jane’ and ‘Unity’, and many others, with their quaint-sounding but deadly serious Cornish prefixes ‘Wheal,’ see HERE. 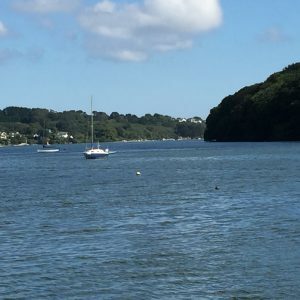 When tin streaming declined, coinciding with the fall in the price of tin, resourceful mining companies dug under the estuary to extract the remaining subterranean tin gravel. While the laden ships sailed above them, miners toiled 30-40 feet below. The principal family behind Devoran’s industry was the Agar-Robartes, whose huge estate was at the sumptuous Lanhydrock House near Bodmin – now a National Trust property open to the public. 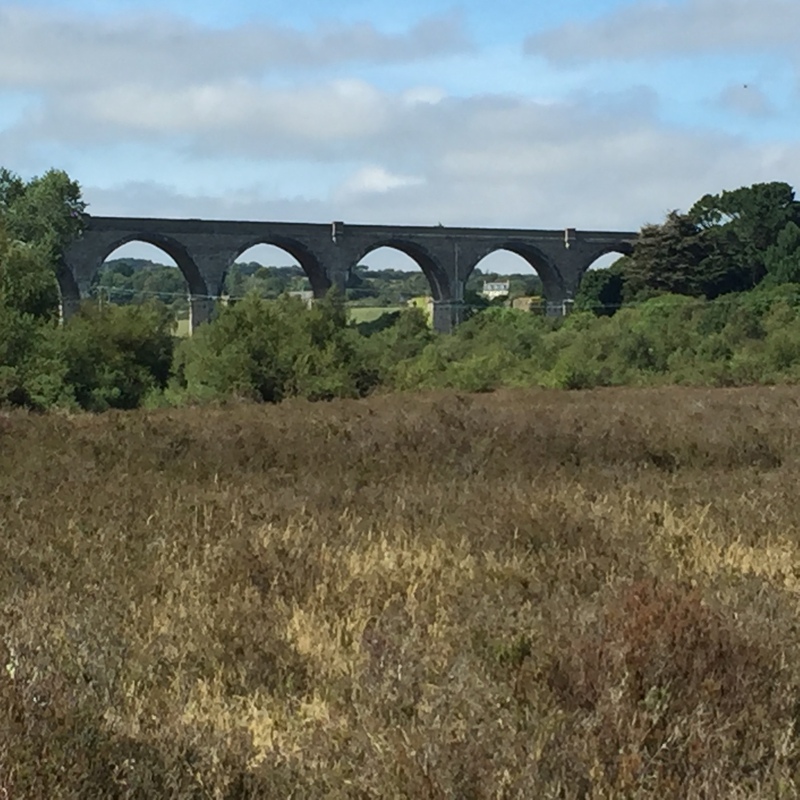 Halfway between Devoran and Bissoe stands a magnificent viaduct, carrying the line from Truro to Falmouth. Brunel’s original stumps are still visible below the later, wooden Victorian arches. decades of expansion from streaming to later deep ‘hard-rock’ mining, and from the construction of the County Adit drainage system. 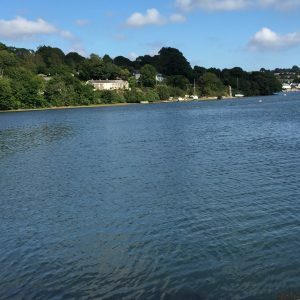 Bissoe is from the Cornish for birch trees. 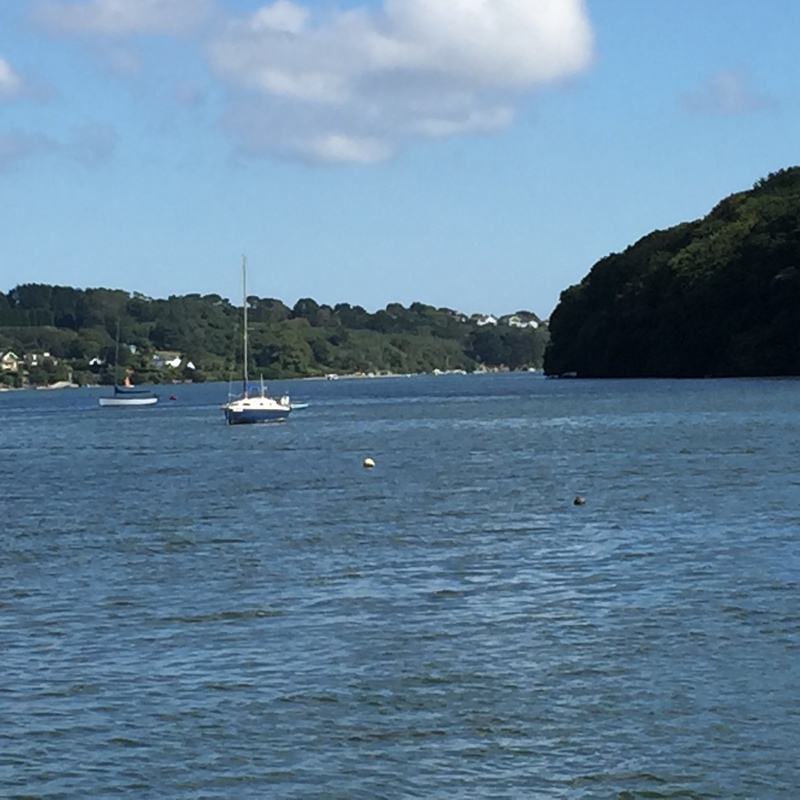 In the 1600s it was a small port at the head of the estuary. Tin streaming activity, using at that time a complex system of leats and sluices, produced so many ‘tailings’ that the valley silted up with this waste material, cutting the place off from the sea. Nearby is the Point Mills Arsenic refinery. Some imposing building fragments remain, as my picture shows. It closed after 100 years of production in 1939. Arsenic was used principally as a pigment in dyes for the Lancashire textiles industry, and as an alloy with other metals. It was exported for use in sheep-dip, an insecticide and for glass-making. 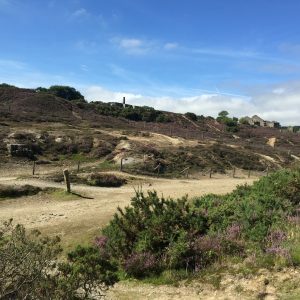 The land itself in places remains scarred and pitted by mining activity, or piled high with waste heaps – now further scored by the tracks of mountain bikers. This wild, bleak moonscape is weirdly beautiful – a far cry from the ‘Cornish Riviera’ images about which I’ve written in recent posts. Yet this is as authentically ‘Cornwall’ as the more famous and picturesque Charlestown or Portloe. 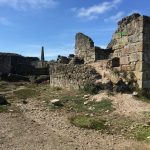 plenty of information, maps, photos, videos, etc. at this website. 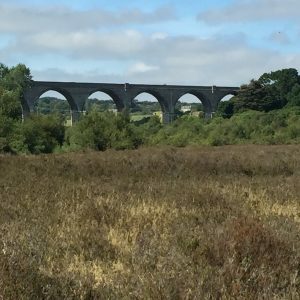 It’s teeming with wildlife and flora: dragonflies, damsel flies, birds. No fish, though. 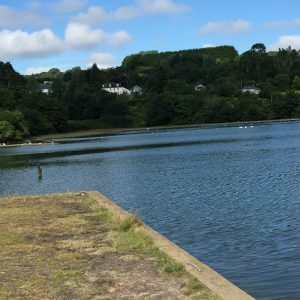 The river Carnon is still so polluted by mineral contamination that its mud shines unnatural orange, and the water is eerily coloured as a consequence. Our dog Bronte, when we were walking here some years ago, didn’t realise there was a river: it’s so overgrown that it looks like a ditch, fell in and was swept away. She was lucky, my wife and I were able to save her. Other dogs since have drowned. Portreath derives from the Cornish for sandy cove. Tin streaming was recorded there as early as 1602. The mining port’s construction started in the 18C, and expanded considerably in the second half of the 19th. Its purpose was similar to that of its rival, Devoran. The first ‘railroad’ in Cornwall was the Portreath Tramroad, originally with horse-drawn wagons (steam engines only arrived in the mid-19C), started in 1809, to link with the copper mines at Scorrier and Poldice, near St Day. By 1812 it stretched to Scorrier House, owned by the Williams family who later occupied Caerhays Castle, about which I wrote last time. 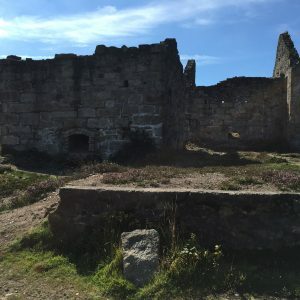 This family, along with the Bassets (whose Tehidy estate is vast, and now a popular park), made a fortune as pioneers of the Cornish mining industry. 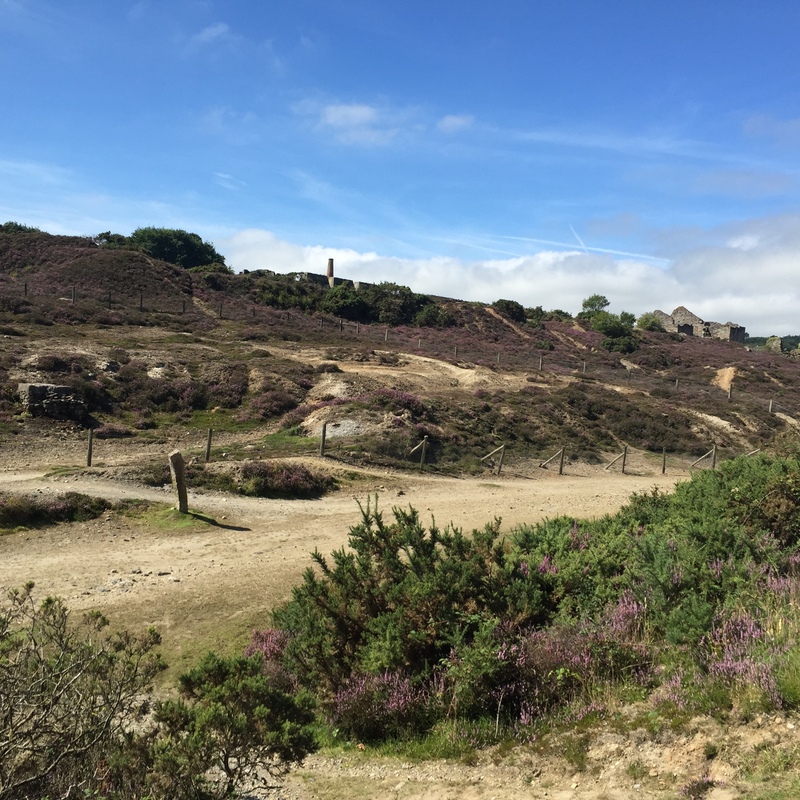 To the south is the site of the old cable-worked, steam-fuelled incline, which linked the harbour with the main rail line at Carn Brea, near Camborne, another busy mining zone until the 20C. 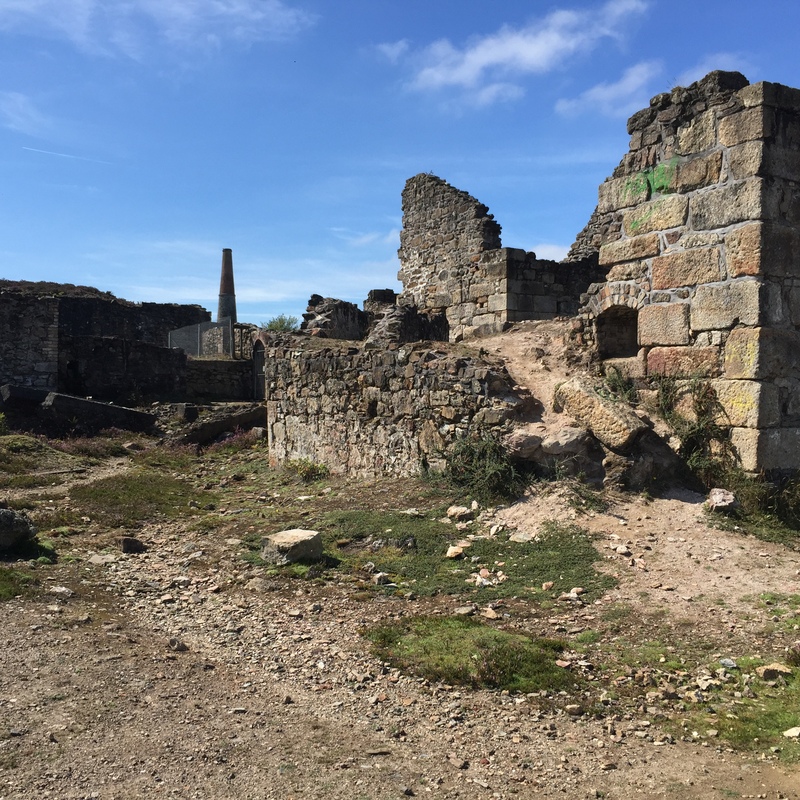 The link between the grand estates like Lanhydrock, Tehidy and Caerhays, the mines and industrial archaeology is constantly apparent when one travels through Cornwall. All along the cycle trail we saw old engine houses, chimneys and ruined buildings. 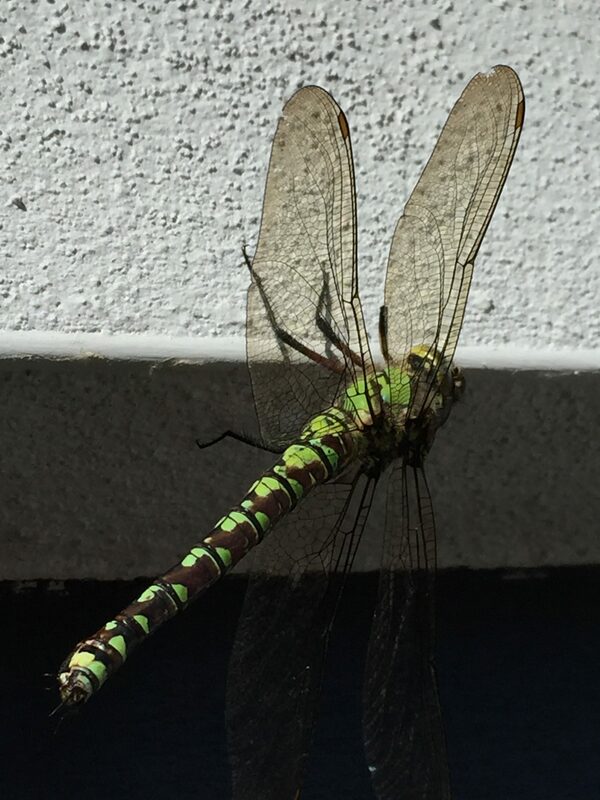 When we got home this handsome dragonfly was basking in the sun over our front door lintel. 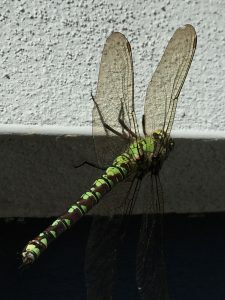 I tweeted it to Cornwall Wildlife Trust, who kindly identified it as a female Southern Hawker.